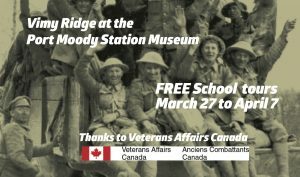 Thanks to the support by Veterans Affair Canada we are able to offer FREE school trench tours at the Port Moody Station Museum. Not long ago a group of cadets visited the trench. As usual our volunteers were at hand to guide the group through the trench and provide historical information. Thank you to everyone who came out to our Candlelight Vigil of Remembrance. It was a touching ceremony. Thank you to all who have fought for us and we will always remember your sacrifices. Thank you to Volunteers John Goheen , Cary Price, Markus Fahrner and Alan Fox that helped organize and took part during the event with readings. Thank you to Crystal Wei and Aaron Wu for helping with the food and staff Brianne Egeto , Jim Millar and Dorian Nijdam. A big thank you to Snapd for coming to take photos , Bryan ness that took all the photos during the event and Geoff Scott from Tri Cities Community Television for videoing the event. (From Left to Right: John Goheen, Cary Price, Markus Fahrner, Alan Fox and Jim Millar). 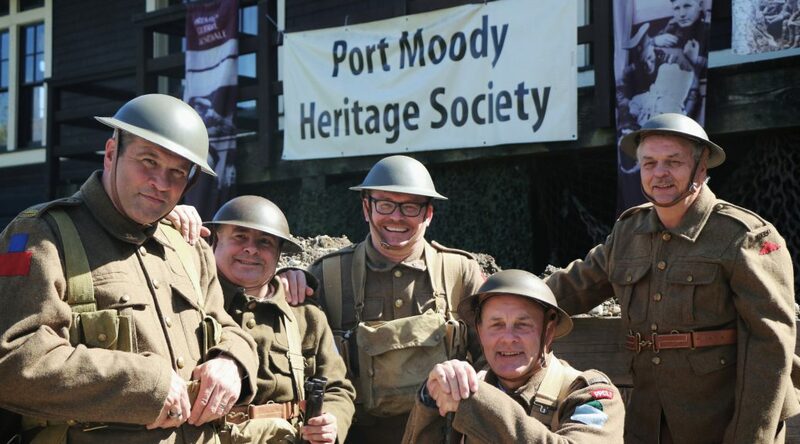 The Port Moody Heritage Society is lucky to have these guys as volunteers. We have a group of dedicated volunteers ( John Goheen, Markus Fahrner, Alan Fox and Cary Price) who helped with the education part of the exhibit. 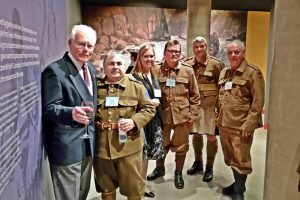 They worked with staff to create a Life in the Trenches school program, created a Great War Talk series ( given monthly )and have done a Re-Enactment Photo Project. These guys come in to help with school programs, give talks on a monthly bases, are part of all trench related events and are very dedicated to educating the community. 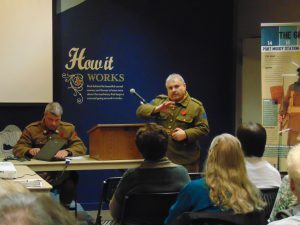 Last night we gave a talk at the Burnaby Historical Society about Canadians in the Great War and tonight we are having a Candlelight Vigil of Remembrance at 8pm at the Port Moody Station Museum. We invite you all to join us. Pictures following show what kinds of things are volunteers have been working on. Markus Fahrner designed our banners for our Education Program and Great War Talks. John Goheen provided all the information. 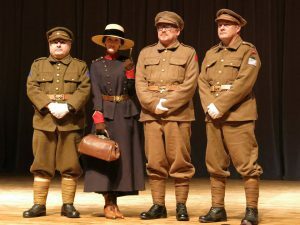 Cary Price, Markus Fahrner and Alan Fox were in our Fashion Show showing what soldiers wore. Jim happer, Cary Price, Brianne Egeto, Markus Fahrnerm John Goheen and Jim Millar at an awards banquet. 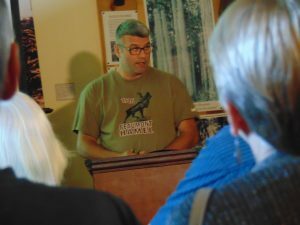 Cary Price talking about uniforms during the talk at the Burnaby Historical Society. 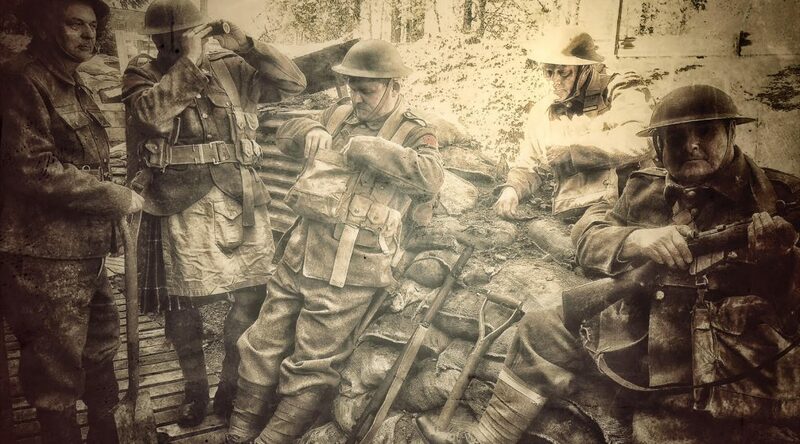 One of the Reenactment photos the guys created. 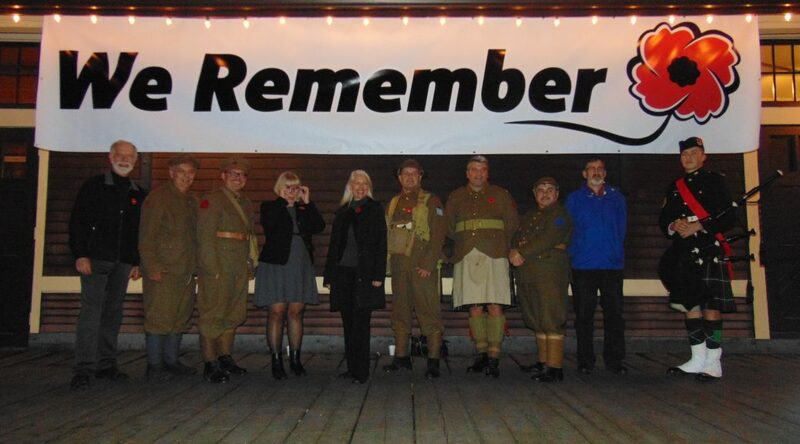 A Proclamation for 9 Port Moody Soldiers went to the Great War and died serving. 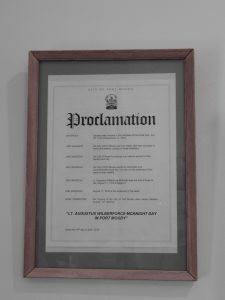 Executive Director Jim Millar has been able to get the City to do a Proclamation for the 100th Anniversary of each of the 9 soldiers for the day that they died. All nine soldiers bravely fought and lost their lives during the Great War and we want to remember their sacrifice. 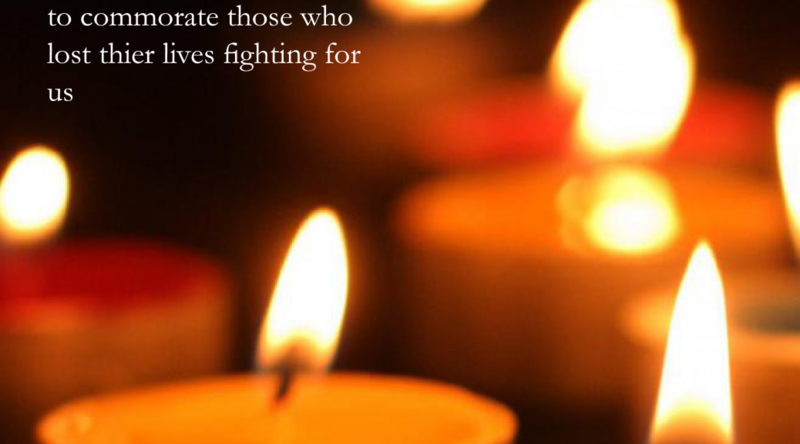 Please join us on November 10th at 8pm for a Candlelight Vigil of Remembrance. Please call the Museum at 604-939-1648 if you wish to attend. Most museums have attractive landscaping to draw visitors. Port Moody Station Museum, at the back of its Murray Street property, has some wooden buildings dug into the dirt and a muddy field of barbed wire and weeds. But that’s OK, as the goal is historic, not esthetic. Dug by hand by a group of volunteers to commemorate the 100th anniversary of the First World War, what looks like a wasteland is, in fact, an educational display depicting life in the trenches during the Great War. 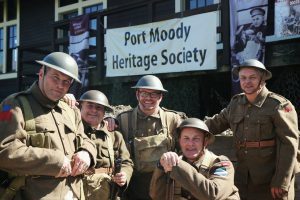 John Goheen and Markus Fahrner, who were among the volunteers (along with Port Moody’s Guy Black) that designed and built the trench, are hoping the display will help people connect with this important period of Canadian history. 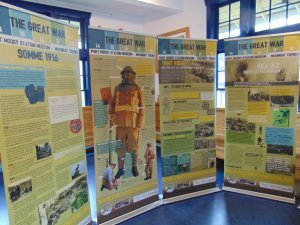 “These kinds of artifacts help people to connect, they are gateways, they create an image that people can relate to and hopefully take way and decide whether it’s worth remembering,” says Fahrner, a graphic artist who has designed the banners for the WWI project. 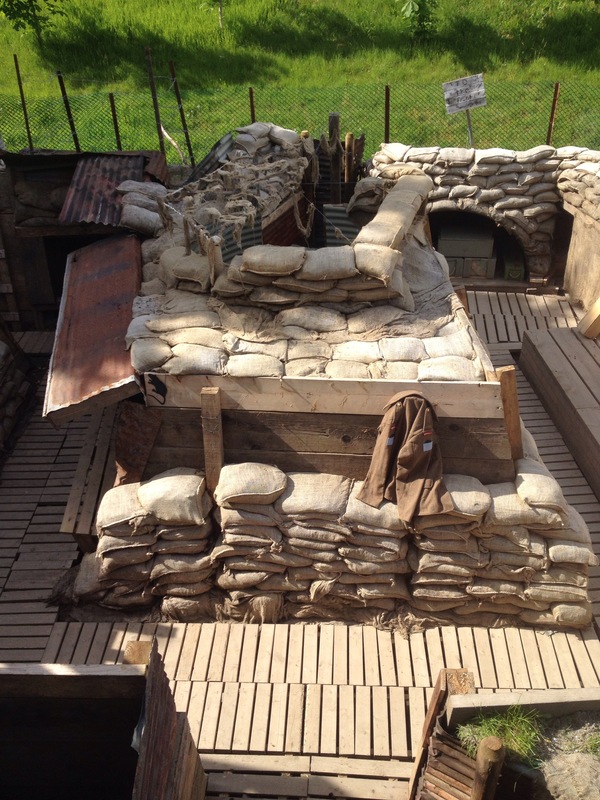 “It’s pretty close to what it actually looks like,” says Goheen, speaking of the replica trench, living quarters and no-man’s-land full of craters and barbed wire. With winter approaching, the living quarters are damp and cold, not unlike what it must have been for soldiers in the month of November during the war. 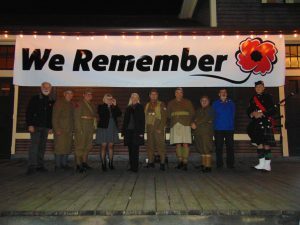 Next week, in the days leading up to Remembrance Day, a candlelight vigil will be held in the trench, with the community invited, and there will be a presentation about Passchendaele, a battle fought by Canadian Corps soldiers from mid-October to mid-November 1917. Goheen, a local school principal and battlefield tour guide, says the Canadians distinguished themselves against great odds and terrible conditions. On Nov. 6, 1917, the Canadians and British attacked to take the village of Passchendaele and on Nov. 10, Canadians cleared the Germans from the eastern edge of Passchendaele Ridge. Goheen said the Canadians had become an elite fighting force but the battle took its toll — more than 4,000 were killed and 12,000 were wounded in Passchendaele. 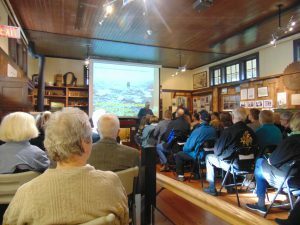 But Fahrner and Goheen hope people turn out for the Great War talk to learn more about the battle and the role Canadians played in it because the more understanding there is, the less chance there is that it will happen again. 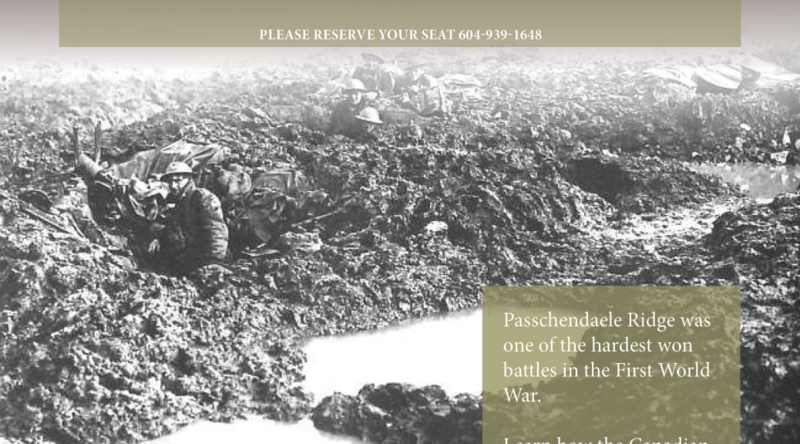 • The Great War Talk on Passchendaele takes place inside the Port Moody Station Museum, 2734 Murray St., Port Moody on Sunday, Nov. 6 at 1 p.m. It’s free to attend but you’re asked to RSVP at 604-939-1648. 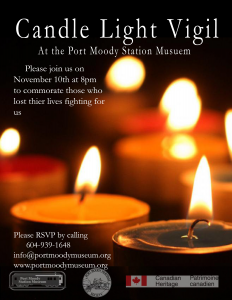 • The Candlelight Vigil for Remembrance takes place Thursday, Nov. 10 at 8 p.m. at the Port Moody Station Museum. 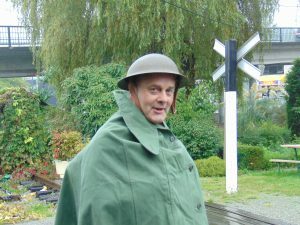 Since the McKnight Trench was created, the Trench Squad has dedicated themselves to helping with school programs, creating a Great War Talk Series and has started a WW1 Photo Re-enactment Project. The squad works hard to make sure that the soldiers that fought in WW1 will not be forgotten. Here is an example of one of the re-enactment photos. Pretty much at every tour people ask if the McKnight trench is build exactly as it would have been done during the Great War. The quick answer is: Yes. 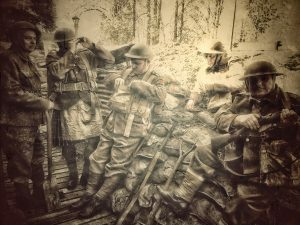 We build the trench to using historic manuals and cross referenced historical images. 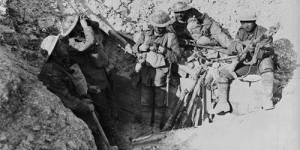 The trench is a composite of different types of trenches found. 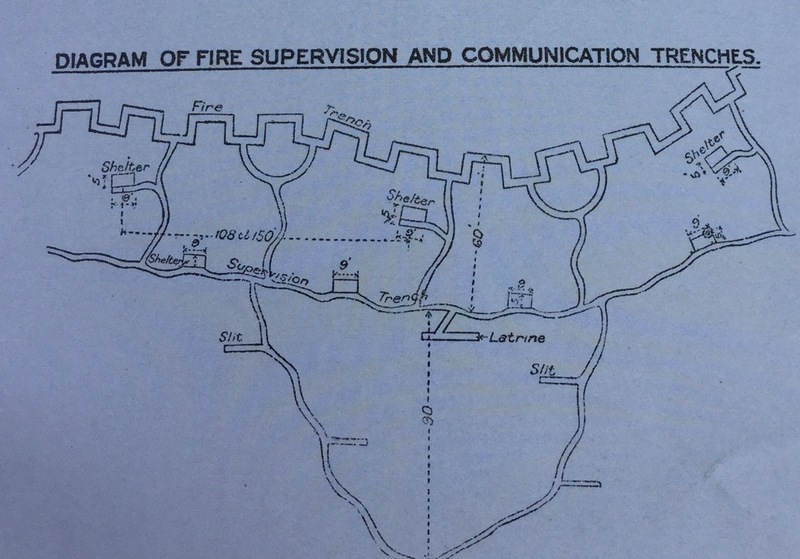 Due to limited space it combines fire trench, and service trenches. 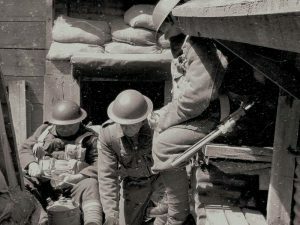 What was a morning like in the trenches? Well before twilight all men stand on the fire step. Stand to. This was the time a possible attack could happen. When it was fully light the men stood down. Now the soldier’s daytime routine starts. The best art of the morning is the rum ration. It has to be consumed instantly to prevent sharing and hoarding. Next breakfast of corned beef, tinned stew, bread or biscuit. There is also syrup and jam. Next stop is personal hygiene. Dirty men get diseases. A respirator does not close well over beard stubble. Whatever the temperature, winter or summer, the men have to keep themselves clean. The next important duty is recycling. Every morning soldiers are responsible to collect tin cans, ammunition cases, anything that does not belong to their fellow soldiers. Unfired ammunition is cleaned and empty shells would collected and eventually be melted down. Gunners were expected to return fired shells for refilling. Most battalions have their own salvage dump. The recycling was necessary because during the Great Was every resource was precious. Next weapons have to be cleaned. In the trench sights are always set to 200yrds (182m) to ensure that targets in no man’s land can be hit. A fabulous day at the trench thanks to the many visitors today. This is really what makes all the efforts worthwhile. Sharing history and thanks to the trench bringing it to life. Don Thomas on Engineer’s Win !